Nikonians Academy Director Mike Hagen has been fine-tuning the curriculum for the coming months and the results is an impressive line-up of the Academy's most popular photo adventures. These adventures cover wildlife, landscape and specialized photography in all parts of the globe. Mike Hagen?s Galapagos photo adventure trip (September 13-20, 2015) has only one cabin remaining on the expedition yacht. The cabin will accommodate either a single traveler or two travelers willing to share. Travel with Jim Stamates to Grand Teton National Park this September to photograph animals in the fall. This is Jim?s most popular workshop and fills early. The dates are September 28 - October 1, 2015. The 15th Anniversary Annual Nikonians Photo Adventure Trip (ANPAT-15) Badlands in the Fall, begins September 26, 2015 and has less than 10 seats available. Your trip coordinator will be Eric Bowles and your hosts will be Nikonians founders J. Ram?n Palacios (jrp) and Bo Stahlbrandt (bgs). You can follow preparations and discussions here. 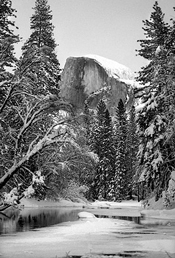 The Advanced Photography Course: The Zen of Thinking, will be begin October 2, 2015 at Yosemite National Park. Led by Michael A. Mariant, this two-day course is limited to five students to ensure an intimate environment, fostering the best learning opportunities possible. For those Nikonians wanting to explore the east coast of the USA, Lester Picker will be leading his popular Maine's Acadia National Park photo adventure, October 15-19, 2015. Nikonians Academy Director Mike Hagen has added a proven popular photo adventure to next year's schedule. Based on the success of last year's adventure, Lester Picker will be leading another trip to what has been called "the most beautiful island in Asia." This will be your opportunity to photograph wildlife and culture in an exotic and safe location. Wildlife opportunities rival that of Africa and include leopard, elephants, crocodiles, buffalo, monkeys, eagles and all types of colorful birds. The group will also do safaris in two other National Parks famous for their wild elephant populations, monkeys, crocodiles, colorful birds, and other wildlife. Most evenings you will have an optional image review and critique session. Your air-conditioned bus will also have a certified country guide and a porter throughout the trip to help with luggage at each stop. Porters are also available inexpensively at each location for those who wish to hire someone to help carry gear. Lester Picker is a Nikonians Academy faculty member and professional photographer who has more than 600 published credits in National Geographic books and magazines, Forbes, Fortune publications, Better Homes & Gardens and dozens of other magazines and newspapers. His blog (lesterpickerphoto.com) is widely followed and often quoted by media. Les received the prestigious 2011 Canada Northern Lights Award for Best Travel Photography. He received his doctorate in ecology from the University of Maine and has worked as a nature and photography guide in many locales. 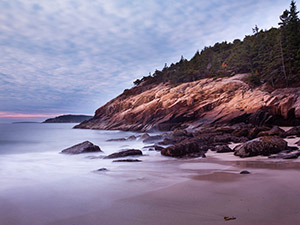 For those Nikonians wanting to explore the east coast of the USA, Les has a wonderful photographic workshop scheduled in Maine's Acadia National Park , October 15-19, 2015. Les completed his graduate studies in Acadia NP and knows the area like few others do. His workshops takes participants to the most dramatic scenes at the right time of day to help participants capture stunning images. Nikonians Academy Director Mike Hagen is nearly finished with cabin arrangements for his Galapagos Photo Adventure and he's been checking on the overall curriculum for the coming months. The trend he's observed is leaning towards limited seats. This includes the Acadia National Park Photo Adventures as well as Mike's Galapagos trip, the 15th ANPAT in the Fall and Jim Stamates' Grand Teton September excursion. Les Picker's annual trip to Acadia National Park is set to go for October 15-18 and he still has a few seats available. Some call it the most beautiful National Park in the country, a tiny gem compared to its larger siblings. Whether or not you agree, Maine?s Acadia National Park is most definitely a sparkling jewel for its combination of geology, flora, fauna? and weather. During your 4-day exploration of the exciting photographic possibilities in Acadia you will explore its intimate coves and vaunted mountains, its pristine seashore and lush forests. Les timed this workshop to take advantage of fall foliage with its resplendent colors. Each morning you will embark on an adventures taking you to the fog-shrouded rocky coast or to photograph sunrise atop a mountain. Each evening you will have an optional image review and critique. 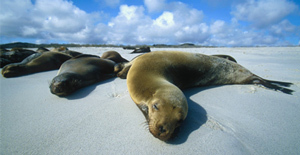 Mike Hagen?s Galapagos photo adventure trip (September 13-20) has only one cabin remaining on the expedition yacht. The cabin will accommodate either a single traveler or two travelers willing to share. Each day will feature a different area of these amazing islands. 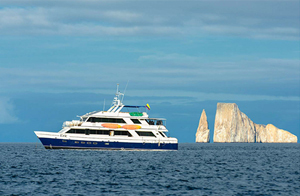 The trip includes 7 nights on a Galapagos cruise and two nights in Guayaquil Ecuador. The expedition yacht has the ability to anchor close to photographic attractions and the small group size means you can be nimble while photographing nature's splendor. The food on your yacht is wonderful and cooked by some of the best chefs on the water. Everyone will have access to snorkel equipment and kayaks, and will also have the opportunity for underwater photography if you decide to take on that challenge. This is the perfect trip for couples to participate in a safe, yet intrepid adventure together. If you've been looking for a time to check Galapagos off your bucket list, then this is it! The 15th Anniversary Annual Nikonians Photo Adventure Trip (ANPAT-15) in the Fall, starting September 26, is down to less than 10 seats available. Iceland in July is sold out and we have a waiting list. Our next trip is set for July 2016 and we'll have it posted on the website in a couple days. This is Jim?s most popular workshop and fills early. 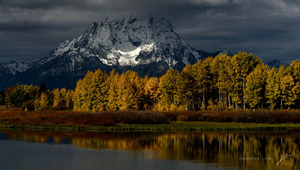 The landscape of Grand Teton NP has turned to brilliant golds, rusts and browns wetting our appetite for great scenics. You arrive before dawn at Schwabacher Landing and wait for the sun to kiss the tops of the Grand Tetons. The reflection in the beaver pond and autumn cottonwoods add the perfect touch to your first image of the day. Then on to Mormon Row to get the classic shot of the barns with a fall color backdrop. That?s just the first morning. Join Nikonians Academy with Jim and Kathy Stamates for an intense 4 days of photography learn, shoot, and experience Grand Teton National Park in the fall. The dates are September 28 - October 1, 2015. Instruction will be in the field and there is no strenuous hiking. Nikonians Academy Director Mike Hagen tell us his Galapagos Islands trip is all set to go and he has a few spots remaining. Mike has been taking photographers to the Galapagos for a number of years now and would love to share the beauty and wildlife with you. Join him and a bunch of other adventurers to photograph the unique fauna of the Galapagos Islands. The trip runs September 13-19, 2015. The food on your yacht is wonderful and cooked by some of the best chefs on the water. You will have access to snorkel equipment and kayaks and have the opportunity for underwater photography if you decide to take on that challenge. Michael Mariant's photography workshops to Yosemite are some of the best in the industry. He's been traveling to and running workshops in Yosemite for decades. Raised in a family of teachers, it was natural that this Brooks Institute of Photography graduate would return years later to provide lectures on these approaches to photography. At the same time, what first started as week-long photo trips to Yosemite, Michael began his private fine art landscape workshops following a growing demand from the Brooks students. He has quite a few workshops catered to different photographic genres. 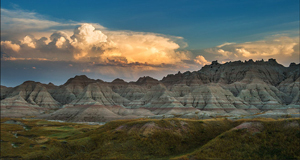 The 15th Anniversary Annual Nikonians Photo Adventure Trip (ANPAT) in the Fall season is set for the Badlands of South Dakota (September 26-October 3, 2015). 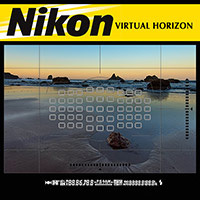 Our annual photographic adventure trip this year will celebrate the Nikonians 15th year. Join our founders in what is sure to be a grand celebration! 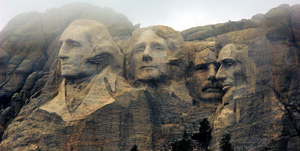 This location was chosen not only for its unique scenery; it also has one of the largest concentrations of National and State Parks, monuments, memorials and caves in the Midwest. It offers varied and unique photo opportunities for landscapes and wildlife. For those Nikonians wanting to explore the east coast of the USA, Les Picker has a wonderful photographic workshop in Maine's Acadia National Park from October 15-19, 2015. Les completed his graduate studies in Acadia NP and knows the area like few others do. His workshops takes participants to the most dramatic scenes at the right time of day to help participants capture stunning images. 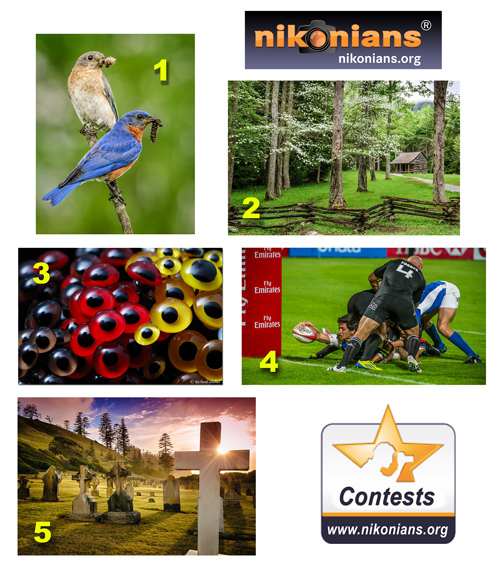 Nikonians Contest Coordinator David Summers (dm1dave) has posted the results of the April Contests. 1. Wildlife ? ?Animal Pairs? theme winner Mark Kraus (pipco) from Ohio, USA with his entry titled ?Dinner Time." 2. Landscape ? ?Signs of Spring? theme winner Charlie Choc (cchoc) from Georgia, USA with his entry titled "Spring in the Smokies." 3. Macro ? ?Round or Circular? theme winner Richard Dubiel (Dubes) from Ontario, Canada with his entry titled ?Glass Eyes.? 4. Sports ? ?Score? theme winner Stephen Hindley (tembo) from Dubai, United Arab Emirates , with his entry titled ?The Stretch.? 5. Travel ? ?Second Tier Destinations" theme winner Robert Cranna (robcran) from New South Wales, Australia with his entry titled "Norfolk Island Cemetery." Are you ready to join in the exchange of great images? Check the latest contest update from David Summers for details.